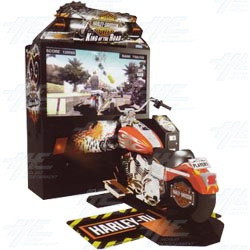 The Harley Davidson: King of the Road DX Cabinet licensed motorcycle game from Sega. The DX cabinet features a replica Harley Davidson motorcycle and a huge 55 inch Screen. Players can choose from a variety of different motorcycles to race on, and the game also has a 70's rock soundtrack.